I divulge…I’ve finally conceded to the addictive nature of reality TV. I blame the foodie in me…and my daughter, who spent an afternoon over Christmas holiday watching a MasterChef omnibus. We were hooked. “Can I have a MasterChef birthday?” she inquired, knowing perfectly well I would rise to the challenge. Friends who know me, know I’m party-crazed, theme-obsessed and committed to raising the bar when it comes to kids parties. 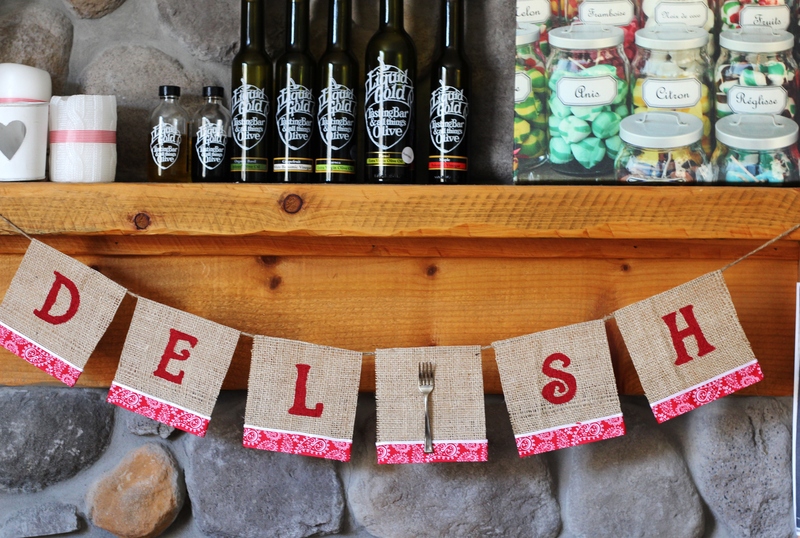 From down-to-earth camp parties to glamorous spa spectacular, and even a splashy mermaid party complete with custom-made tails, there is no theme too challenging — even a party that involves nine kids (plus a few adults) creating chaos in the kitchen. Here’s the highlights from our MasterChef 12th birthday party, in partnership with my fabulous sister, owner of Paige and Peacock Event Designs, recently launching its children’s party division ‘Petit Fours @ Paige and Peacock‘, together we conspired to pull off a chef party like no other! 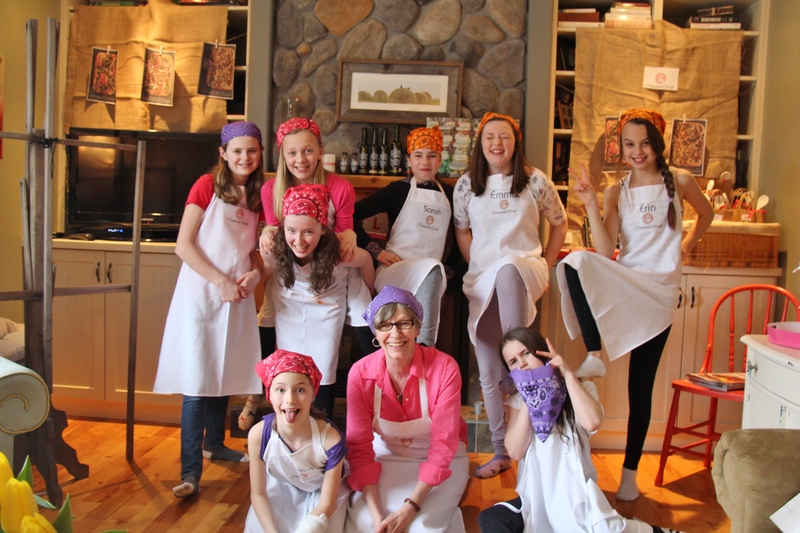 Girls received Masterchef Aprons and drew colours to be placed on either the Red, Purple or Orange team. Our three celebrity chefs made their introductions and girls received an Agenda to set them up for the next three hours of culinary creativeness. Master the art of separating an egg white from an egg (hilarious), then whip up snowy-white mini-meringues for a delish Pavlova, in under 20 mins. 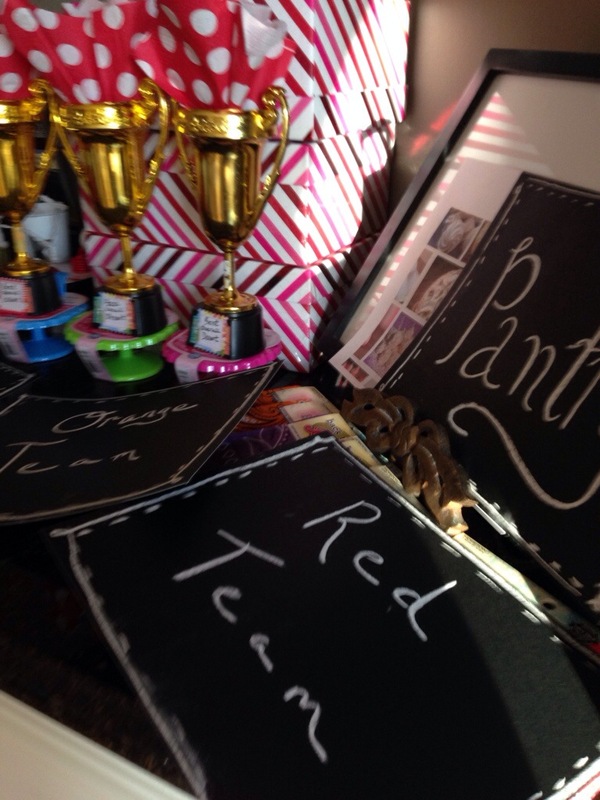 A MasterChef party wouldn’t be complete without the famous Mystery Box. At our party, three boxes contained ingredients for making the ‘quintessential starter’: The Humble Dip. Their task — to create either a fruit, veggie or chip dip in under 15 mins. Fruit dip for the orange team. Judging the fruit dip, veggie dip and chip dip. So impressed with their creations! The purple team with their fancy chip dip were given a ‘huge advantage’ for the final Pavlova challenge and ‘Chef Alvin’ was keeping a close, objective eye on the chefs. Next the girls were tasked with creating a ‘Master Pizza’. They were given pre-made dough but had to roll the dough and design a masterpiece art-like pizza using unusual ingredients they wouldn’t usually put on their pizzas. Unfortunately Team purple forgot the sugar in their meringues! Forgot the castor sugar? 2 tsp. instead of 1 cup. Oops! This final challenge took them to chao time. We judged the pizzas and the teams each voted on the best Pavlova (not voting for themselves). Awards were given and we sang ‘Happy Birthday’ with a candle-adorned ‘Daniel’s Lemon Lime Cheesecake‘ coined after an episode of MasterChef Canada, masterfully made by Autumn (as mom was flu-smothered). 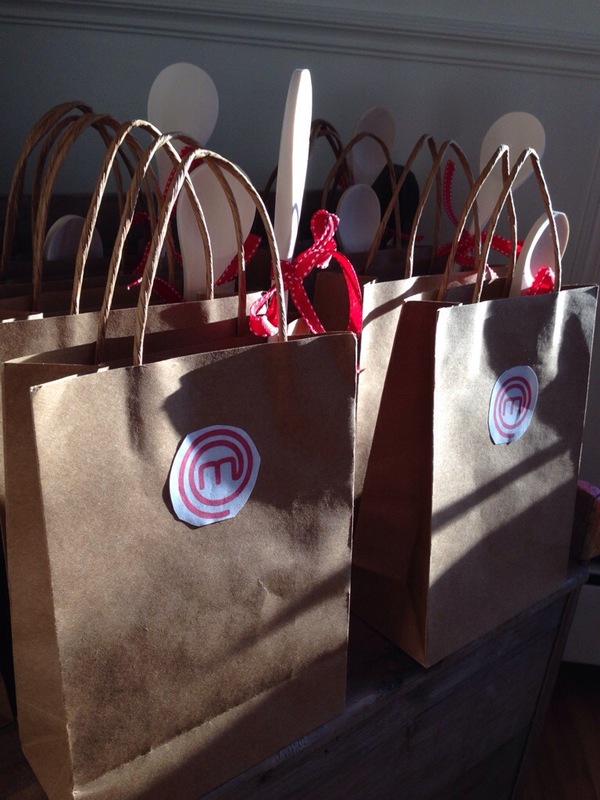 A special delivery from the MasterChef Canada kitchen! Super WOW – Thanks Auntie Sarah! It was a crazy three hours…but worth every smile, belly laugh and miscracked egg. Our last day and a half was awesome. Mum and I walked down the ski hill for fun, Castie all bundled up the best would could…and went to the Foggy Goggle for lunch. 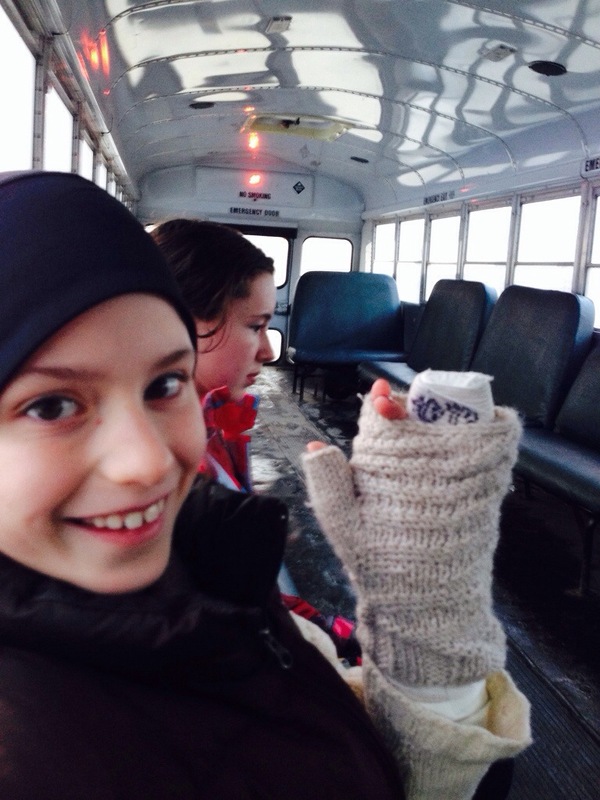 I got to ride the Chondola–round trip and I bumped into my basketball buddy Paige. It was great to step onto the ski hill, even if I couldn’t ski this time. Two weeks until Castie comes and all this itchiness disappears. It’s been a great week full of distractions! The Summit hotel pool was as hot as bath and the hot tub…even hotter. Can you see Castie in the background wrapped in bags? We’re heading home early ahead of the snow storm. 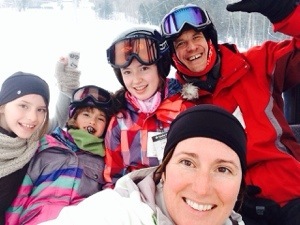 Family selfie from the Chondola! 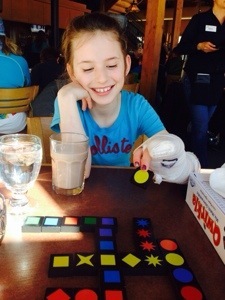 “March Break can be full breaks…literally falling so close to February’s icy slick grasp, sometimes the best laid family holiday plans are fractured by an injury or illness. 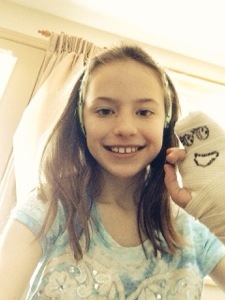 My daughter’s finding the silver lining and wanted to make a diary of her ‘attached at the finger’ buddy, Castie. Perhaps her optimism can help other families salvage the dramas that often disrupt a well-planned family ‘vacay’.” With a little help from a creative…often desperate and slightly frantic mum, trying to solve the puzzles in her world. Click here for more Cast on Vacay. And here’s some fun we had with The Claw. 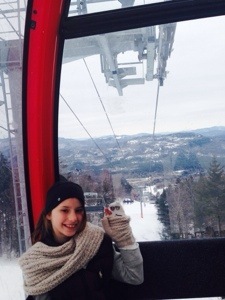 Non-ski ski vacays are hard and my cast is giving me blisters between some of my fingers. Luckily mum has special cream. “Let’s finds a cosy nook and play Quirkle,” said mum. We swapped hotels to make it easier for mum and dad to ‘tag team’ skiing and I’ve a whole new hotel, pool and arcade to explore. Super fun! 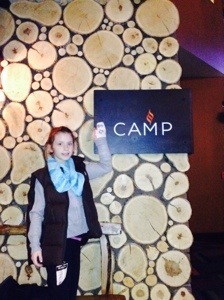 The restaurant is called Camp and it has canoes on the roof and trees everywhere. Their porridge is the best. Click here for more Cast on Vaca and for our Grand Finale. Tonight we took the shuttle bus into Summit lodge and went tubing! Castie loved it! We bundled her up in the only gloves that would fit — mum’s new wooly gloves knit by grandma last Christmas. It’s a good look! I also wore mum’s vest as Castie is too big for my ski coat. Brrrr. Click here for more Cast on Vaca and for our Grande Finale! How to keep busy on a ‘non-skiing ski holiday’? 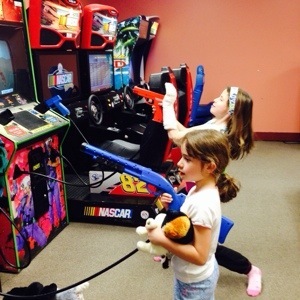 Today, Castie and I went to the games room and played the claw. Castie was nervous, she thought she would be sucked in! But can you believe it, we got two toys. Castie almost fainted. Playing games with my peeps. The Claw was no match for Castie! 2. Find water and make a splash! All wrapped up for swimming…outside. I’m pretty sure I’m not supposed to swim…but desperate measures call for desperate acts! “It’s a wrap!” said Dad! If you’ve ever tried to swim with a cast, it’s tricky. Castie thought the whole experience was spooky. That’s because dad wrapped her up in two bags, taped her closed to make sure no water would sneak through. Our hotel has a heated outdoor pool! We swam out under this reef-type doorway into the cold, wintery evening — but the massive pool was warm. The hot tub was even better. I got to swim two times today! It’s my big sis’ birthday so mum booked us in for pedicures! 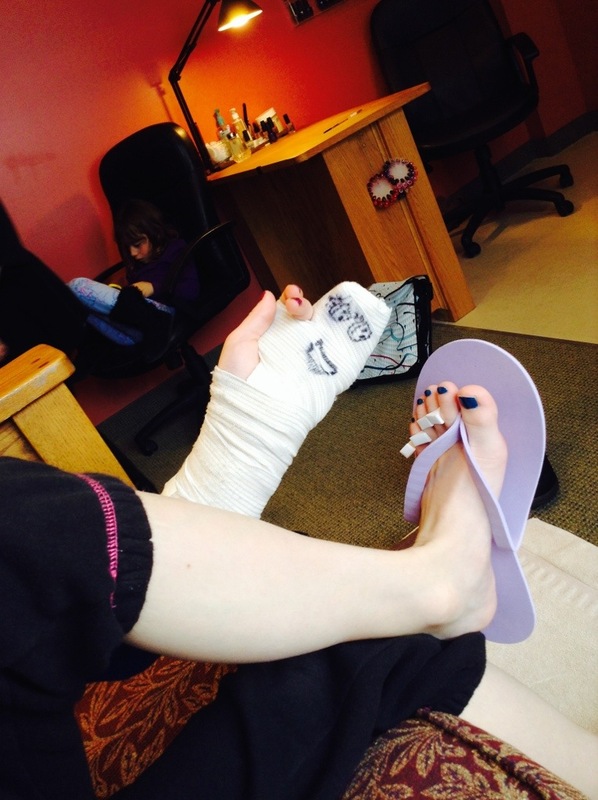 We had a sister day of pedicures and lunch – all by ourselves. Super cool! Oooh sparkly blue toes get a thumbs up from Castie. Click here for more Cast on Vaca. I’m smiling here…but really I’m not smiling. It’s so frustrating and I’m trying to be positive…sort of. 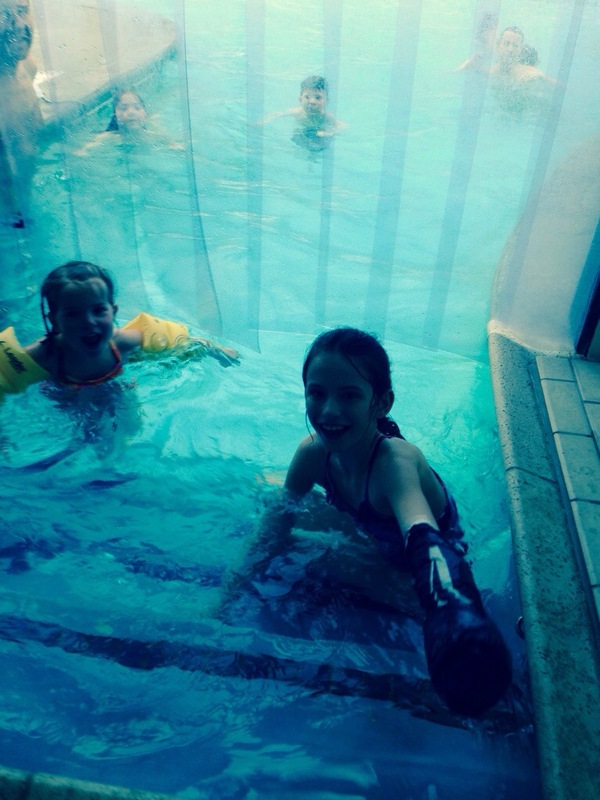 Like, watching your sisters go swimming…torture! Luckily Castie is always smiling. This morning we hanged out with my big sis and went for mani’s… at least an eight finger manicure. Super fun at the spa! And mum ordered us a major hot choc with cherries on top for breakfast! I’m liking this vaca. Today we drove 12 hours to get from Halifax to Sunday River. We were supposed to stop in Bangor but dad said we got here too fast and we’ll be bored. I was bored sitting in the back of the car because my iPod ran out of batteries. But Castie was throbbing after Tuesday’s operation. It’d only been two days. So mum said sitting still is best — strapping me in the back seat seemed to do it! We got to stop twice, once for brekkie at The Silver Fox in New Brunswick and once in Bangor at Applebees before we FINALLY arrived! The fight began for ‘who gets to press the elevator buttons”… I bet this only happens in MY family! Check out my adventures with The Claw and how Castie coped with tubing at top speed!